Woah. Best way to ensure your house smells like Delicious. (Yes, I capitalized that and turned it into a noun. It was that good.) Seriously. If I could have bottled the scent of my apartment while this stuff was cooking, I totally would have. And while you may be thinking that burning an apple cinnamon candle would suffice in this situation? Trust me. This is WAY better. 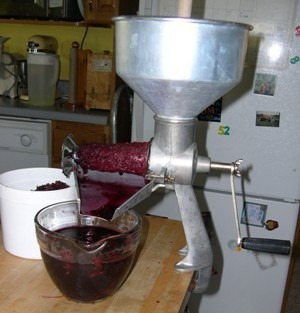 When I was a kid my mom had what we referred to as “an applesauce maker”…in other words, this really intimidating looking machine that we used to toss apple into, and on one side the apple puree would come out a slide onto a big bowl and on this other side would come all the apple remnants – cores, seeds, and skin. It creeped me out, to be honest. I found a picture of it on google, and as it turns out, it’s a food strainer. I guess that makes sense, now that I’m thinking about it, but back then it was just creepy. Anyway. 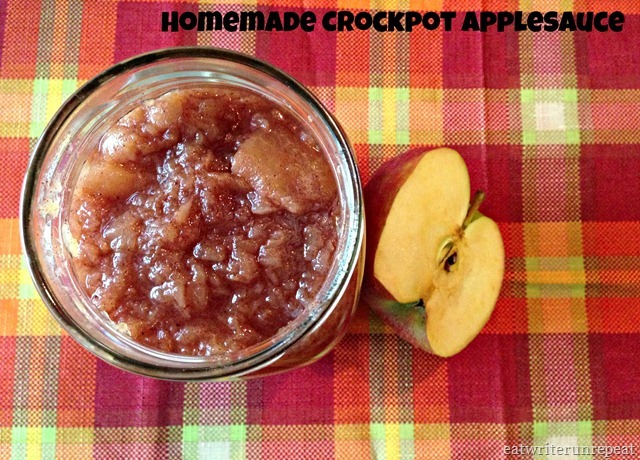 Once we had the applesauce separated we’d cook it on the stove and then jar it and freeze it for the winter. But I remember not liking that applesauce for some reason. My middle sister would gobble it up, but I was not a fan. I don’t know if my tastebuds changed since then or what, because this stuff? Is awesome. Better yet – there is absolutely no added sugar in this! Although we didn’t add sugar to the stuff we made when I was growing up either, which I suspect may have been why I didn’t like it back then. Good thing I grew out of that! I couldn’t believe how easy this turned out to be – and once I tossed it into the crockpot all I had to do was let it go for a few hours and I was rewarded with a house that smelled like apple, cinnamon, clove and nutmeg. If I bottled that scent, I’d call it October. That’s what it reminded me of anyway! I wasn’t sure how much applesauce I’d get, so I kept this batch to ten small apples and got a 24 ounce jar of sauce. I’m already planning my next apple run so I can stockpile this stuff for winter! Peel, core, and chop your apples. I chopped mine into rough chunks; the smaller you chop the apples the thinner your sauce will be. 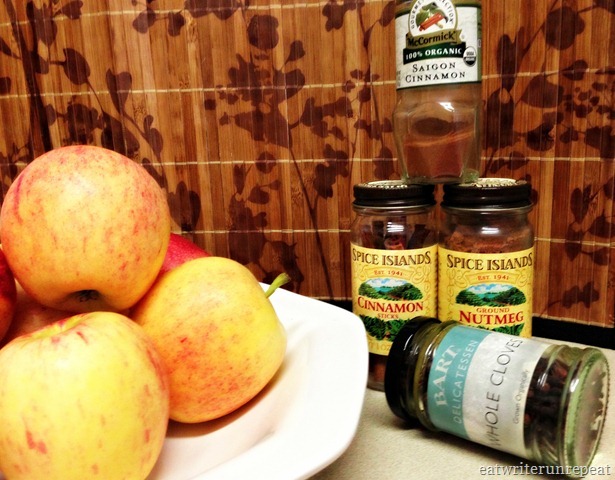 Toss apples into your crockpot with the spices and water. Cook on high for 4-6 hours, stirring occasionally. 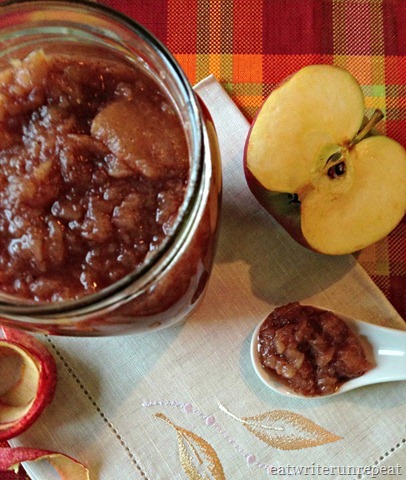 Once applesauce is cooked down (to your desired consistency), remember to remove the cinnamon stick and cloves. Serve hot or cold! 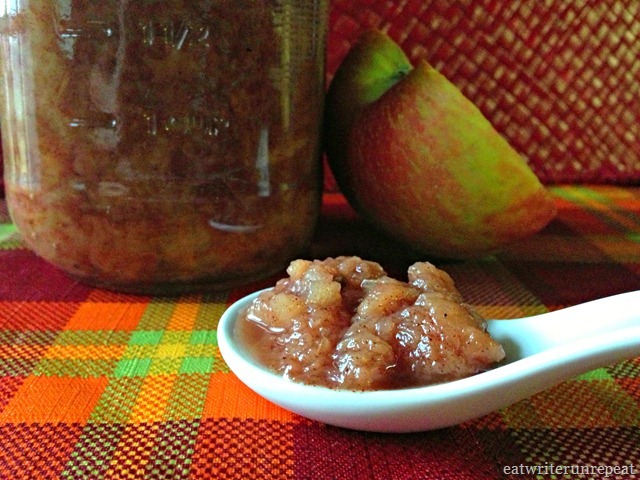 Posted on 26 September 2013 25 September 2013 by BeePosted in Fall Recipes, Paleo, Side Dishes, Sweets, Whole 30Tagged apples, applesauce, cinnamon, crockpot, fall recipes, nutmeg. This looks so much better than the no flavor mush applesauce that I am not a fan of. 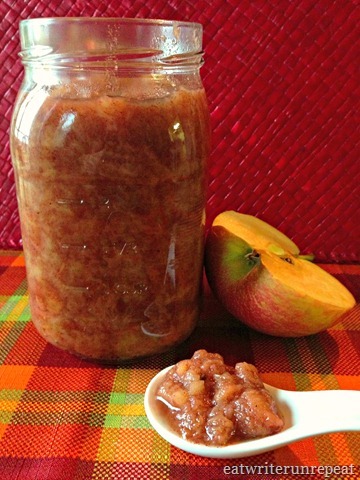 I am going to actually try this applesauce recipe. Pingback: Grain Free Pumpkin Pancakes with Apple Raisin Compote | eat. write. run. repeat! 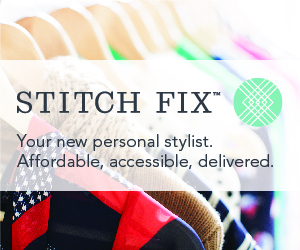 Pingback: October Bucket List | eat. write. run. repeat! Pingback: Grain Free Pumpkin Bread | eat. write. run. repeat! Pingback: Happy Thanksgiving! (better late than never?) | eat. write. run. repeat! Pingback: Whole30 Day 21 – What to write about? | eat. write. run. repeat!